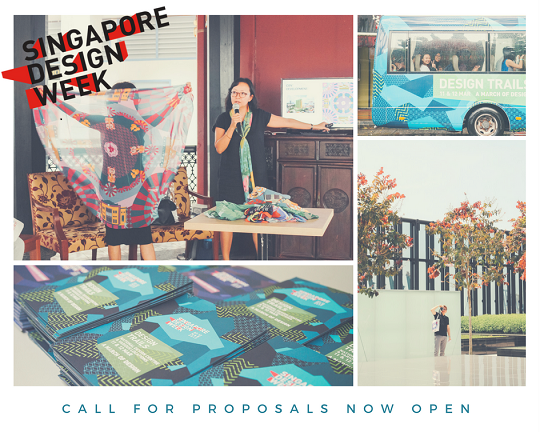 Singapore Design Week (SDW) 2018 Call for Proposals: We Want You! SDW 2017 ended on a positive note with record achievements in the number of activities, partners and participants. A total of 101 partners came together to organise over 130 events which were attended by more than 81,000 festival goers. SDW 2018 aims to scale to greater heights and widen its impact to more of our partners, stakeholders and the community. 1. Design x Heritage Trails: Design x Heritage Trails: A curated journey of wonder and fascination to innovative offices, furniture retailers, ateliers, design studios, craft specialist stores, schools and many other places of interest. Celebrating 50 years of bilateral relations between Singapore and Indonesia, the three-day extravaganza will see over 20 brands from Singapore and various parts of Indonesia showcasing their products at the National Design Centre. There will be clothes, accessories, home ware, F&B and even Indonesian cultural performances held alongside the marketplace. Friday, 3 November, 5pm - 9pm and Saturday & Sunday, 4 & 5 November, 12pm - 8pm. The DesignSingapore Council is proud to be a supporting organisation at the NAMIC Emerging Applications Summit 2017, a gathering place for Addictive Manufacturing (AM) practitioners, regulators, investors as well as creative designers in industrial design, construction, consumer lifestyle and food printing. Learn about the latest global AM developments and discover Singapore's role in this industrial revolution. 7 November 2017, Raffles City Convention Centre. The Festival of Disruptors brings together the most dynamic and inspiring individuals, start-ups and technologies in a compelling showcase of personal talks, panel discussions and performances focusing on innovative disruption in one place. The DesignSingapore Council is proud to be a Supporting Organisation. When purchasing your ticket, simply apply the code "DSG200" by 27 October to enjoy discounted tickets!